Education Career Fair Next Week! Next Monday the Career Center will be hosting the Education Career Fair in the Stern Student Center Ballroom (3:00-5:00). This is a great opportunity for anybody who is interested in a career in education. And remember, you do not have to be an education major to attend the fair. School systems from all over South Carolina, Georgia, and North Carolina will be attending. For a complete list of participating schools and more details check log into CISTERNonline and click on Career Fairs. 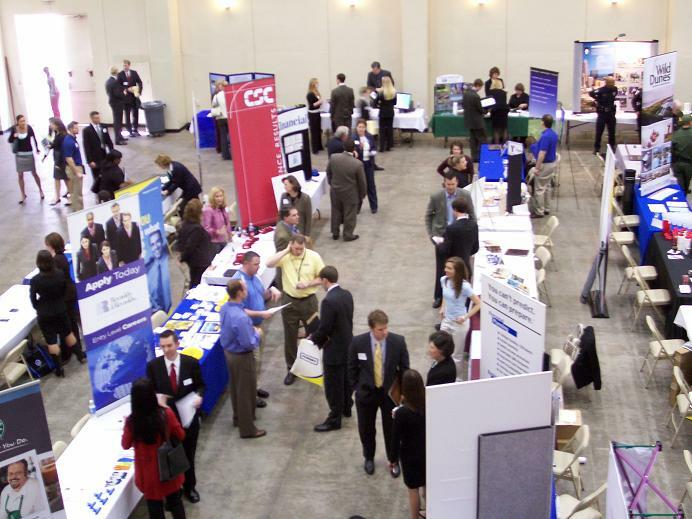 Career Fairs at the College of Charleston are open only to students and alumni of the College. FutureQuest Career Fair This Week! Remember this Wednesday, February 20 is the FutureQuest Career Fair 2008. The event will be in the Gaillard Auditorium on Calhoun Street (easy walking distance) from Noon to 3:30 pm. If you do not feel like walking the Career Center will be providing a shuttle van for students. It will pick you up in front of the Stern Student Center. We are expecting approximately 94 companies, graduate schools, and non-profit organizations. There will be a little bit of everything for everyone. Check out the list of participating organizations on our homepage: http://www.cofc.edu/~career/. Also, on our homepage you can find more tips for preparing for the Career Fair including a video tutorial. Do not forget to dress in business attire and bring copies of your resume. Good luck and see you at FutureQuest! FutureQuest: Less than 25 days and Counting. . . The day is finally here. After four (or five) years, you are now ready to go into the world of professional employment. But where will you find that wonderful new career? One choice is at FutureQuest 2008, the annual spring semester career fair. There will be close to 100 different employers lined up to talk to you about possible futures with them. You can go to the Career Center’s website to find more information about the Career Fair like who is attending and what they are seeking. One thing to remember about the Career Fair is to visit as many employers/graduate schools as possible. Maybe you feel pretty confident that you want to work with _______ but have you also thought about _______? Never pigeon hole yourself into one job or place to work without looking at all the different options. As you have most likely guessed I am a big fan of tips and rules. Well, here a few to follow when preparing for and coming to the Career Fair. 1. Do your research. Look at the different companies coming to the Career Fair on our website and investigate them. What do they do? Where are they located? Are you interested in them? 2. Prepare your resume and bring at least 20 copies. By now you should have a well written resume that highlights your experience and achievements. If you do not—Write One! Please bring it by the Career Center for the Career Advisor to look at. I love looking at resumes and will enjoy helping you make yours perfect. 4. Don’t be shy. The Career Fair is not a time to show your shyness. Be bold and approached the different employers/grad schools because they are not going to just grab you out the crowd. Go say hi, talk about their company, talk about yourself. These were just a few tips to get your started. Also, check out the list of companies already slated to come to the career fair and the new preparation video on our homepage. Remember come to FutureQuest and get started on that wonderful new career that is waiting for you. Remember this week is the Career Fair and Graduate School Expo. The event will be in the Gaillard Auditorium on Calhoun Street (easy walking distance) from Noon to 3:30 pm. Also, don’t forget to wear at least business casual or suits. If you have any questions about attire come by the office or write it below in the comments section. Next week the Career Center will be hosting the Education Career Fair in the Stern Student Center Ballroom. This is a great opportunity for anybody who is interested in a career in education. And remember, you do not have to be an education major to attend the fair. School systems from all over South Carolina, Georgia, and North Carolina will be attending. Below are a few of the different school systems attending.